We met Scott Holbrooks, Vice President of Fulmer Helmets, at the 2008 Cycle World International Motorcycle Show in San Mateo, California. We talked about the need for quality, stylish helmets for budget-minded riders, and Scott gave us the run-down on the Fulmer product line. Fulmer offers a full line of helmets in a variety of styles and graphics. There are many Snell-certified models to choose from, and all carry DOT certification. The S1 full-face helmet is Snell M2005 certified. The MSRP is USD $89.95, putting it well within the reach of budget-minded riders. 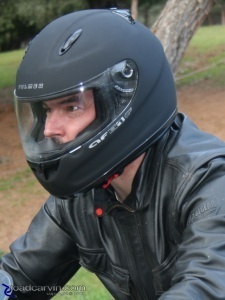 Fulmer S1 full-face helmet in flat black: Photo courtesy of Fulmer Helmets. Experts recommend that you replace your helmet every two to five years depending on use; just about everyone says you should replace the helmet after any significant contact with the ground (and some say this includes a drop from seat height). 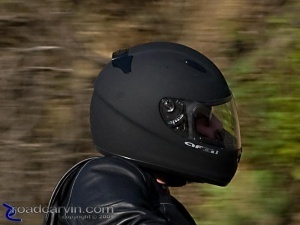 What if you are a motorcycle rider on a budget and you want good protection for your head, while still protecting your pocketbook? What if you are a new rider and want protection without risking an expensive helmet if you take a minor spill? A high-end helmet can set you back hundreds of dollars – some models exceed $500. It is possible to find a quality helmet a reasonable price. There are lots of manufacturers on the scene, and many models to choose from. The main concern, in my view, is to find suitable models carrying a Snell certification rather than settle for DOT self-certification. First impressions: The overall construction quality is good. I found some minor detailing issues with the inner breath spoiler—the corner of the breath spoiler popped out of its mounting when reaching in to the face opening to lift the helmet. I couldn't figure out how to re-secure the breath spoiler properly, although I was able to push the tab back in to the original location, it seemed like it would come out very easily, so I'm not sure if this is a defect specific to my helmet or if this was a common problem with this model. Breath spoiler defect? : I had to push this back in to its original location but I wasn't sure it would stay put for long. The S1 seems to be fairly light. I'm sure there are lighter helmets to be had, but I was surprised at how light it was. I'm used to low-cost helmets being a bit heavier than this. I credit this to improvements in available materials over the last decade. Helmet weights are dropping. Inspecting the interior of the helmet, I see a Snell M2005 certification decal. The padding and liner quality is good, and I found no visible stitching problems, blemishes or other flaws. The helmet includes a nicely made drawstring bag bearing the Fulmer logo, for protection while you aren't wearing the helmet. This is a nice touch, as a helmet bag helps protect the visor and the helmet's finish. The S1 I choose has a slightly 'rubberized' matte (mostly flat) black with subtle silver logo and trim decals. This finish looks good on the helmet – it's a very subtle look which I prefer over the more flashy graphics preferred by other riders. Fulmer offers a wide range of colors and graphics for those wanting higher visibility or more 'flash'. The S1 visor hinge features a six-position detent; the visor action is stiff (at least when new). You have to push up on a small tab at the lower front of the visor in order to lift the visor. No big deal; I got used to that on other helmets, I can get used to this one, too. The Quick-Release ("QR1") visor release requires two hands to push the release then push or pull the visor end to insert or remove the visor. I managed to remove and replace the visor fairly quickly even on the first try, but it did take a bit of struggling to get everything lined up. The breath guard is made of a stiff (but not completely hard) plastic—with a sharp inner edge that will cause discomfort if it makes contact with your nose—be sure to choose a helmet that provides ample space up front, in order to avoid problems here. Front vent looks like it'll catch a fair amount of airflow. The vent is manipulated via a small 'button' in front, which might be a bit difficult to operate when wearing gloves. Push up to open, down to close. Top front vents are small, elongated ovals. Slide back for open, forward for closed. Looks like they'll be a bit difficult to operate through gloves while wearing the helmet. Top rear vent has a large plastic pad; looks like it'll be a bit easier to manipulate with gloved hand while wearing the helmet, if you can find it on the back of your head. Slide towards front to open, slide back to close. The S1 is available in two graphics designs and solid colors. Face shields are available in a variety of colors and coatings. I normally wear a medium helmet; the large S1 helmet was a little loose with a helmet liner. The S1 performed nicely while riding up the California Coast in a mixture of rain and fair weather. The front top vents were stiff to open and close, the rear vent was much easier to operate. The front vent operated smoothly. The vents kept out the water when riding in heavy rain. The gasket on the face shield sealed tight, and the face shield's clarity was excellent and I never noticed any distortion. The face opening is wide and allows great peripheral vision. The test rides included several H-D touring models with varying windscreen heights. The noise level was never annoying despite the fact that I did not wear hearing protection. During the ride I had a minor tip-over on a downhill section, and hit my head on the pavement. I did not suffer any noticeable effects from the impact. The helmet has a few small chips in the finish from the fall. 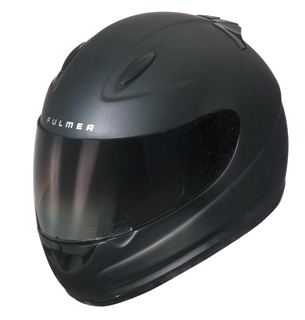 The Fulmer S1 is a comfortable helmet at a very reasonable price. It's a great option for riders on a budget or beginners worried about damaging an expensive helmet. Enough of the laboratory examination, let's take the S1 for a ride. I rode around for about an hour with the S1 on during a March day in California, so it wasn't particularly warm. This limited my ability to judge the comfort during hot weather; I'll provide an update during the summer months. It seemed that the ventilation system didn't make much difference during my testing. 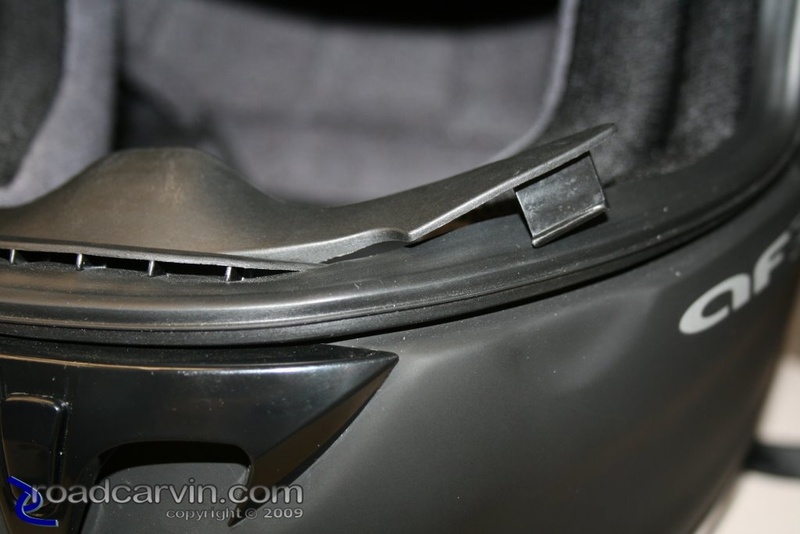 Temperatures in the high 50s (Fahrenheit) and moderately high humidity meant there was a bit of visor fogging which cleared up fairly quickly once underway, so the front chin vent was directing air up at the visor well enough to clear the fogging. The top vents are small and may be difficult to operate with thick winter gloves. All other vent controls were operable with gloved hands. There was a noticeable “whistle” between 35 and 55 mph, which seemed to be more pronounced on cross-winds. Overall, wind noise (without hearing protection) was bearable for short trips – but you really ought to be wearing hearing protection anyway! Vision was unrestricted except at the extremes of side-to-side peripheral vision. The helmet body was just barely visible at the limits of side vision when peering to the left or right. My impression is vision is not impaired in any significant way by the helmet body. The visor quality is quite good – crystal clear and from what I can tell, absolutely distortion-free—this surprised me as I'm always expecting some distortion. The S1 is a good value for budget-minded riders. The styling may not appeal to everyone but it is an attractive helmet offering good functionality and style at a very reasonable price. We found a few minor issues that detracted from the overall quality of the helmet but nothing that would keep us from buying or wearing the Fulmer S1. For more information, please visit Fulmer Helmets. Thanks to Fulmer Helmets for providing review materials and information. There is nothing that can compare to Funny Cars or Top Fuel Dragsters at a PowerAde NHRA event. Sound that makes thunder seem positively impotent, the smell of burned rubber and nitromethane permeates the air, and heat from over 7,000 fire-breathing horsepower. Something every automotive technology lover should experience at least once in their life.